Conscious breathing is so very important because it is such a vital aspect of your life. It is vital in much more than just the physical sense. You can actually control your life's outcomes by learning to attend to your breath and control it. Slowly, deeply and evenly breathe in conscious awareness of the present moment. Slowly, deeply and evenly, breathe out all that no longer serves you. It is an automatic function of our bodies to breathe. When we are not consciously aware of the breath, our bodies just breathe automatically for us. Just like our hearts that beat without our control and our digestion that hums along without a thought, so also goes our breathing. When we become stressed, our entire bodies respond to the perceived threat to our organism. Whether the threat is emotional or physical, our bodies respond the same. All of our muscles tense, getting ready for action. Our hearts beat faster. Our breath becomes more rapid and shallow. This is an unconscious process that happens totally without a thought. When we become stressed, we tighten our bellies, and may even hold our breath unknowingly. When we do breathe, it is shallow and ineffective. The cascade of events that occur in the body as a result of a stressful stimulus is most often from an emotional trigger and not an actual external threat. However, our bodies are unable to distinguish between a "real" or a perceived threat, whether internal or external. The physiologic response it the same. This physiologic response is unconscious and we are not able to control it. This is a fact of the human condition. If the stress response is prolonged and continues to remain in your unconscious, it will create even more stress and dis-ease in your life. When we remember to breathe evenly and deeply, through a conscious breathing process, it becomes physiologically impossible to hold muscular tension. As you know, when your body relaxes, so does your entire demeanor. It only takes 90 seconds for the rush of stress hormones to settle down after a stressful event triggers them. If you hold onto stress and strong emotions for longer than 90 seconds, it is now a choice!! Knowing this brings great power and control to you! 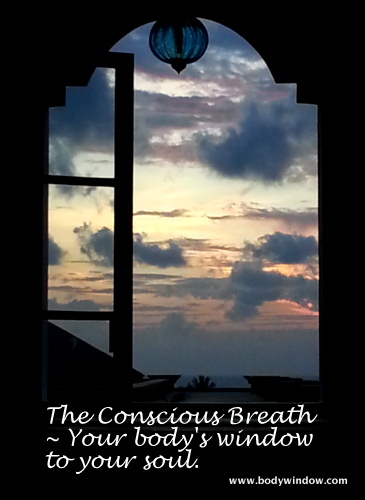 So then, why is it so important to focus on the breath through conscious breathing? Beyond the obvious reason of "controlling stress," there are four more very important reasons. It is entirely a neutral phenomenon. It is the only thing that connects us to all living beings. It stimulates the parasympathetic nervous system and calms the sympathetic nervous system (the two parts of the autonomic nervous system) and is the only part of the autonomic nervous system that we can control. Let's explore the first reason that conscious breathing is so important. The breath has no emotion whatsoever attached to it. It is a necessity of life. You breathe whether you are stressed, angry, happy or sad. There is no judgement attached to breathing. It just is. Breathing, in fact, when you attend to it, brings you immediately into the present. It is impossible to hold unto muscle tension and strong emotions, or to have your mind somewhere else, when you are focused 100 percent on your breath! This is a very, very significant thing and the key to your wholeness and health. Secondly, it is only the breath that connects us to all living things. All humans breathe. It is the thing that connects us to one another. We have many, many differences, but when we contemplate the breath, and our physical processes, we are all the same. Period. All mammals breathe. Reptiles breathe, albeit in a different way, but oxygen is required for them to exist too. Even plants contribute to our process of breathing. Through their transpiration processes, they take our carbon dioxide and convert it to oxygen for us. So we are connected to plants as well. In fact all living organisms require oxygen for their existence. Oxygen is what built the Earth. Thirdly, and perhaps most importantly, you focus on your breath because, even though it is usually automatic, it is the only part of your autonomic nervous system that you can truly control. When you get this concept down in its entirety, you will have great Health and Peace in your life. While I, myself still have a ways to go, I can vouch for the differences that I have brought into my own life with conscious breathing. When I begin to feel that strong emotion rising, it takes less and less time now for me to return my conscious awareness to my breath. This really does work! The 90 seconds that it takes for the adrenaline and cortisone from my excitable sympathetic nervous system to dissipate and pass by, happens more quickly when I am focusing on my breath. Through this deep breathing, I am able to return to evenness. It is the sympathetic part of your autonomic nervous system that is stimulated when you are stressed, through what is called the "fight or flight" syndrome. When you breathe deeply and evenly, this calms the sympathetic nervous system and your automatic fight or flight response to the stressful stimulus. Deeply breathing also stimulates the relaxation response through the parasympathetic nervous system! The parasympathetic nervous system works in exact opposite fashion as the sympathetic nervous system. Learning to breath deeply and wait for 90 seconds to pass is what I call the 90-Second Cure. Because your emotions affect you so deeply, AND affect your body, if you learn conscious breathing, you will prevent a lot of heartache and ill health in your life. This I promise. The way to cure the effects of emotions on the body, is through the body's own process of breathing. When you go to apply your 90-second cure, through awareness of your breath, consciously try to keep your inhale and your exhale balanced. It will re-direct your body's response to one of balance, through the stimulation of your parasympathetic nervous system. The most effective way to stimulate the parasympathetic nervous system is to breathe evenly and deeply! You will feel an immediate release of muscle tension when you begin your conscious breathing. You can even manage powerful emotions like anger, when you master this concept. Fourth: When you focus on your breath, you are bringing yourself into the present moment; each and every time! I know that you know that living in the present is desirable. The future never comes, the past is just a thought and so forth. While you know this simple truth, it is very, very difficult to follow it, isn't it! Using conscious breathing to bring you into the present moment is indeed a spiritual practice, because it is only when you are in the moment that you are able to let go of your attachments to the future or your constant ruminations about the past! It is only when you are in the present moment that you are able to truly be present to yourself through introspection, that you can truly heal your body, mind and soul! This is, in theory, such an easy practice!! It is a wonder, we are not taught this as we grow up, and even more amazing that all adults are not taught this in every school, church, temple, mosque, stupa and synagogue! To begin a conscious breathing practice, several times throughout your day, just notice your breath. Notice the depth, length and quality of your breathing. Just be present to this, in the moment. Turn to focus on your breath, whenever you think about it. When you do not remember to think about it, set your cell phone timer, every hour or so, to remind you. After you become more skilled at just noticing your breath, then move on to the actual breathing practice. First, take a deep breath and focus on the inhale. Consciously allow the inhale to open and relax as you draw in deep into your belly. Prolong the inhale for a count of one-one thousand, two-one thousand, three-one thousand, four-one thousand. Four seconds. Next, turn to the exhale and make it as long, open and relaxed as your inhale - Four full seconds worth. This 4 second inhale and exhale is harder than you think, if you have never practiced breathing techniques (called pranayama in yoga) before! Do this for a round of at least 10 breaths. If you find yourself getting light-headed because your body is not accustomed to breathing deeply, just discontinue the practice. Breathe "normally" for awhile and attempt the 10 breaths again. If you can remember to breathe in this fashion several times throughout your day, each and every day, you will be amazed at the balancing of your body, mind and soul that results! It is especially therapeutic if you learn the practice of belly breathing as part of your conscious breathing exercises. May your journey to wholeness and health be complete when you balance your breath! May you always remain in the moment through your conscious breathing!